We launched our HomeSense for the Holidays contest a couple weeks back (enter to win a $300 gift card!). To up the ante (and because we love snooping in other people’s homes), we’re sharing how two very cool Toronto women, whose style and aesthetic we adore, transformed their spaces with one trip to HomeSense. Here’s how it worked. We sent Stacey Lipstein (@TinyHouseMama) and Jenny Morris (@PlantBabyStudio) each a $500 HomeSense gift card with one instruction: to have fun. 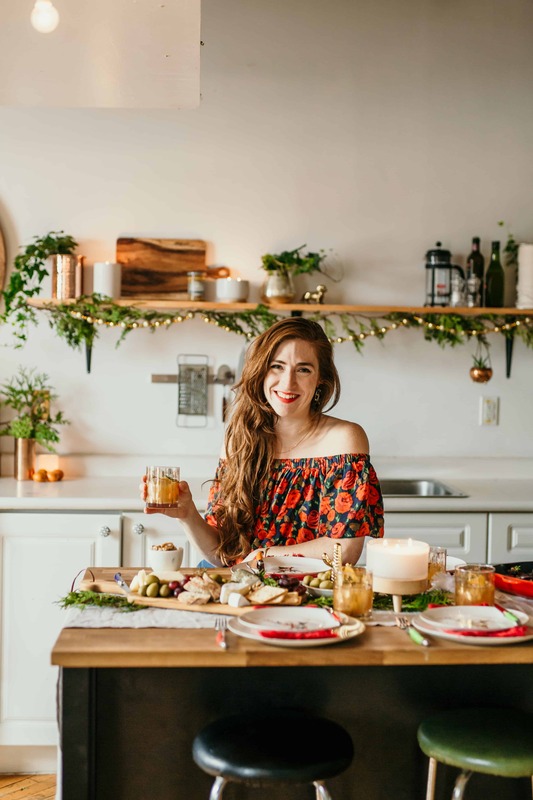 A week later, photographer Lizzie O’Donnell paid them a visit to see what they did with their gift cards, and the results are as wow-worthy as we predicted! 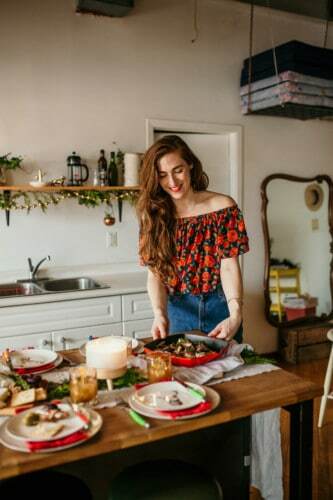 Jenny, who loves a lively dinner party, honed in on the perfect merry-making table setting, and set the scene for the most elegant, but relaxed, dinner vibe ever. In contrast, Stacey has created the coziest nook for winter hibernation that had us dreaming of herbal teas and delicious novels. 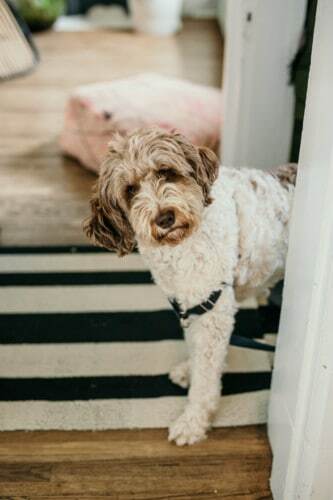 Curious about their process, we asked each a few questions about their approach to home decor, what makes a room complete, and what they enjoyed most about their romp through HomeSense. We hope they inspire you to get creative. SDTC: Did you have a goal in mind before you went to HomeSense? Or did the aesthetic come together when you while wandering aisles? SL: I was craving a warmer, cozier bedroom for the winter months ahead, lots of layers, blankets, pillows, softness and of course candles. Once I got there and started wandering the aisles, finding great boho style gems, my vision totally came to life. All the great finds that came together for the space. Once I picked up a few pieces, it felt super easy to bring the look together, and at such great value. I always love styling spaces and seeing if what I think will work will actually come together, and I feel like it totally did, which was probably the best part! Thanks! I love colour and a more laid-back boho aesthetic. “You can never have too many pillows” is my motto. I am a mom, but I also love design, so I have tried to bring those two worlds together. Nothing in my home is precious, so I would say [my design style is] laid-back farmhouse, boho, fun family style…lol. Do you do anything to alter your space in winter? 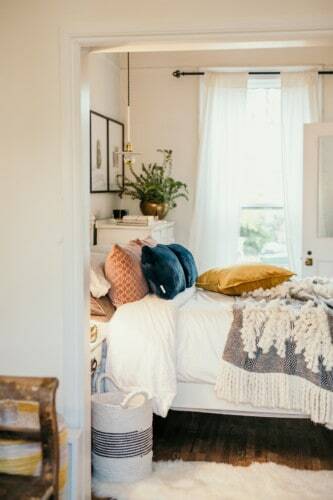 I tend to add in softer textiles everywhere, carpets in the rooms, throws on all the sofas and beds, as well as switch out my pillows for more cozy ones, and of course candles everywhere! I love adding greenery and flowers. Adding a little bit of life tends to complete a space for me and make it feel whole. I love design, because I feel like it can be a real representation of who you are and how you feel. Design can be done both on a dime as well with a lot of money, so it is accessible to anyone. I would say paint is the one thing that costs very little yet makes the biggest statement. I love white, but I also love pops of colour on the wall. 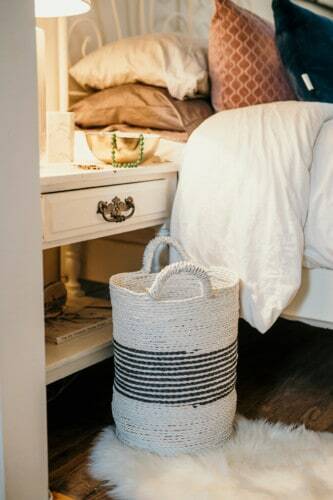 I live in a really small home, so it is really easy to move things around to make a big impact and change up the space, taking it from one style to another, or embracing the different seasons. What holiday traditions are you and your family looking forward to this season? We have a Chrismukkah party with our family every year where we trim the tree, spin dreidels and eat latkes. It is the first holiday party of the season, and the kids love it. Start with what you love. I am a firm believer in loving the pieces you surround yourself with and making sure they aren’t just there for function. Determine what style you would like to achieve in the space (modern, glam, boho), because that will set you in motion to what you want to convey. Sometimes looking at a whole space feels overwhelming, so start small with accessories, playing on the style of your choice, which will also help to bring your vision into other rooms, and you can blend styles. 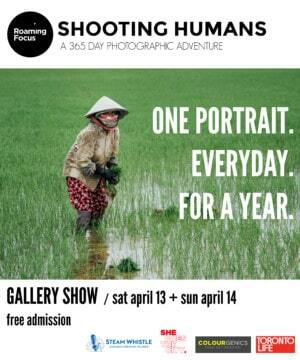 We love the photos. Which items were HomeSense finds? 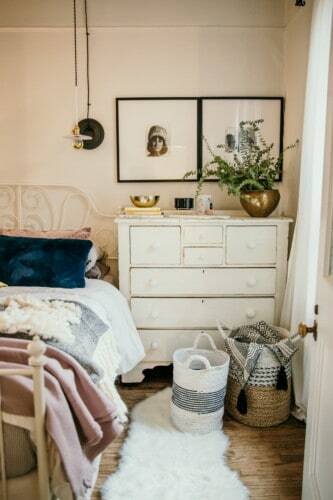 Dusty Rose throw, velvet dusty rose pillows, yellow velvet pillow, blue furry pillows, boho black and white tassel throw, black and white fringe blanket, two wicker baskets, gold jewellery bowl, large marble style candle, black pedestal candle, marble tray, sheep skin floor rug. Nice scores! You’re a stylist by profession. Do you have any design goals for 2019? I have been playing around with creating a home office in my space, which feels very grown up, but it’s also a room that can be super fun! I would love to be able to transition into more design work and continue to create beautiful, interesting spaces for myself as well as clients. It hasn’t even been a full year since I branched out to my own thing, so I can only imagine what the next year brings. SDTC: Did you have a goal in mind before you went to HomeSense? Or did the aesthetic come together when you were wandering aisles? JM: I’ll take any excuse to decorate for the holidays, and this was the perfect opportunity to transform my kitchen space from cold to cozy. When I’m entertaining, guests usually gravitate to the kitchen island, so I kept my eye on items to set a dazzling table. Before going shopping, I installed a simple wood shelf above my sink and looked out for accessories, candles and kitchen essentials from HomeSense that would help make the overall space feel warm and festive (think rustic wood boards and lots of gold accents). 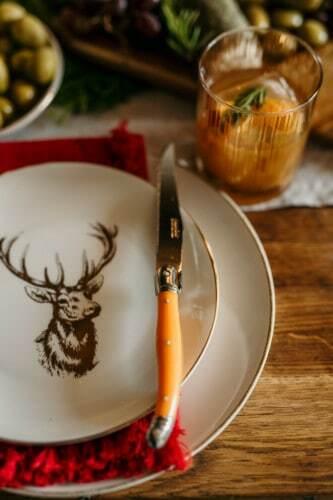 I was really impressed with the options at HomeSense, like beautiful table linens, ornate cutlery, unique serving platters and candles that went a long way to deliver the holiday vibes but will definitely stay out all year long. 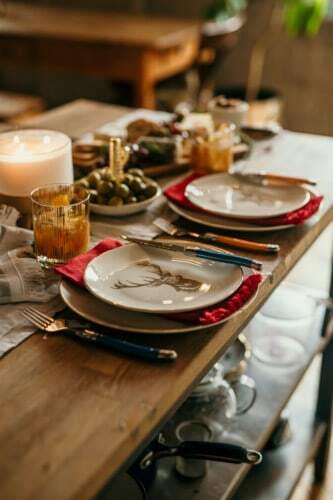 There’s a great mix of super high-end kitchenware priced accessibly (hello, red Le Creuset pan and Laguiole cutlery set of my dreams) along with fun, design-forward accessories that won’t hurt your wallet! Warm, woodsy, natural, a little bit vintage. For this look, I was going for a glam-meets-rustic cabin in the woods vibe. In my business, plantbaby, I’m all about bringing the outdoors in–give me all the plants! It looks like you’re planning on having some nice holiday get-togethers. Got any hosting tips? The holidays are stressful, busy and expensive enough without the added pressure of a full feast. If you want to keep it low-key, just focus on appetizers. My trick is to tell my friends to eat before they come but save room for “snackies” like a cheese board, olives and baguette with spreads. Even if the menu isn’t ornate and complicated, you can still wow your guests with the presentation (and do way fewer dishes!). What are your favourite at-home holiday traditions that you’re looking forward to? Since I moved into my loft, I’ve always hosted the start of New Years Eve. Even though we go out every year, my favourite part has always been that focused time with friends to celebrate each other and pop a bottle at midnight! And for me, an Old Fashioned is synonymous with the holidays. The gold-detailed glassware I got from HomeSense was one of my favourite finds. Lastly, can you list out the items you purchased? The major elements are: gold deer plates, two wooden cutting boards, gold cactus bowl, gold glassware, red napkins, grey linen table runner, ice cube tray, silver pot on shelf, three candles, copper utensil holder (used as a planter in photos), marble dip dish, mustard, Le Creuset pan, kitchen hand towel, laguiole cutlery set. It was actually quite remarkable how much I was able to fit into my budget. Feeling inspired? We sure are. Enter our HomeSense for the Holidays contest now, and share your amazing HomeSense finds with #MyHomeSense. Contest closes December 10. In the meantime, use the store locator to find the HomeSense nearest to you. Good luck!